I've noticed an error with the January report of Lemmings and the anti-CFC campaign report of Marmites. As you probably know, I analyze the killboard because I want to remove kill whoring. If a pilot does 0.1% damage to a 80B titan, he'll be credited with 80M damage and not 80B like on the usual killboards. The error is visible on this kill, where 8% damage is assigned to the RvB pilot, despite the "other guy" is an NPC. After the fix, the player gets all 100%. I also gave the report a format that will be used every month. You can download the raw data for Marmite and Lemming kills, the header is: "Code Date Place Value Pod? 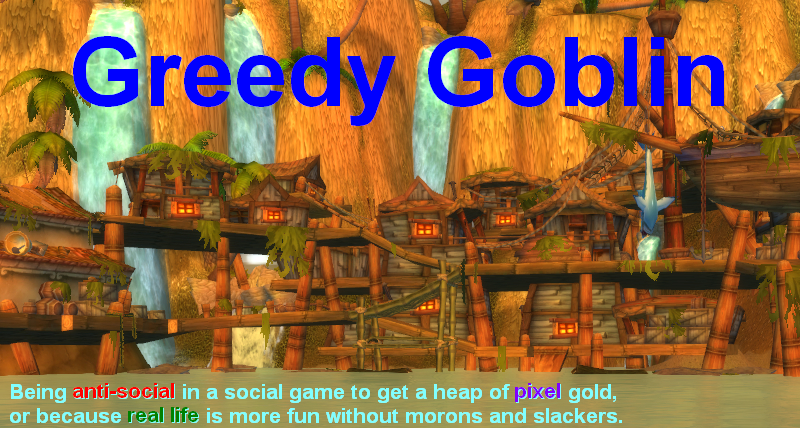 Victim_alliance Lemmings_part Marmite_part"
First, let's see the main goal, damage done to Goons and pets: As you can see, 147B damage was done to Goons and pets, despite the project started on Jan 10 and I could only afford to pay for 2 permawars for Marmites at start, 4 later (you can guess which 4). Marmites also had 781B non-campaign related kills, which is huge if you consider their 300 men size and the fact that this whoring-free, true damage. This also means that Marmite does lot of other stuff and my campaign is just a small part of their operation. Lemmings only had 7.5B non-related kills, which is pretty good focus. After all the Lemming ticker is chosen for a reason! Please note that the zkillboard history for Lemmings says 69.8B damage, while I count only 35.2. The difference is coming from kill-whoring, which is widespread in EVE and makes unprocessed killboards useless even if no intentional manipulation was made: RvB killboard claims 24 titan kills. Now let's see the losses. You can download the raw data for Marmite and Lemmings for your own analysis, the header is "Code Date Place Value Pod? GSF_part Red_part Blue_part ". As a general rule, only RvB puts up a fight, the rest of CFC does not. After all, this is why they were created, to protect CFC interests in highsec. Marmite had 41.1B total losses, which means 95%+ ISK ratio. 1.9B was done by GSF, which is pitiful compared to the 24.5B damage they got. 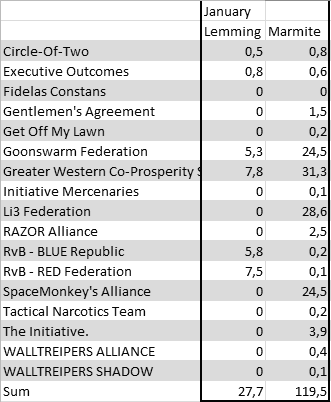 Damage from RvB was near zero, because in January there was no war between RvB and Marmites. February data will be more interesting. The damage from other CFC elements are not monitored, this can change if it becomes relevant. Please note that to monitor an alliance, you have to process the kill completely and sum up all killers who belong to that alliance. Marmites had no 500M+ campaign-related losses. Lemmings had 11.4B total losses. 0.3B damage was from GSF, which is laughable compared to the 5.3B damage done. RvB did 7.9B damage, showing that it carries vast majority of the war, but in January we still had 63% ISK ratio. Lemmings had 3 500M+ campaign-related losses: 657M, 573M, 506M. I put approximately 9B into the project in January, compared to this, the 147B damage is huge. Of course the starting surge helped to get this result and I clearly don't expect 2x more damage for 2x more ISK. The fattest targets were wardecced first, it would be crazy to expect the permadec of WALLT to provide equal kills as PBLRD, but I definitely expect increased damage for increased ISK. The February report will be more interesting and will be up as soon as the data is gathered and I could process it. See now, Gevlon, this was me. Notice the corp and the naming style. Also notice that, despite that loss happening as I was fleeted up w/Powers scaring the pants off of Marmite, it was someone else who killed me. Repped someone w/a suspect timer w/out catching it, got a timer myself, boom. Totally deserved it. By the way, you should let Marmite know that 20 guys is not a 50-man fleet, and they should learn to count before telling us we have 250% of our numbers in Funt-however-it's-spelled local, where even the neuts in the system can do some quick nose-counting and call the Marmites out for being chickenshits whose battleships and marauders flee like little children from the scary CFC cruiser gang. Incidentally, the isk I'm out on this death is exactly 0. Wasn't even my ship. Yay insurance fraud!